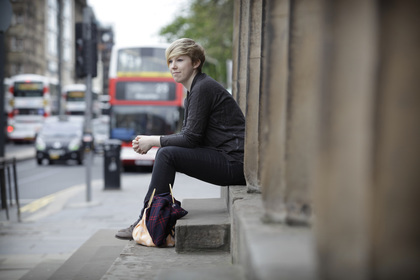 Photograph of Jill taken in 2010 by commercial photographer Sam Sills of White Dog Photography in Princes Street Edinburgh during a collaborative commission. Jill Todd was born and bred in Hillsborough Co. Down. From an early age she showed a natural talent for art and photography and was the first in Northern Ireland to use photography as a medium for A level art. Jill went on to study Photography and Film at Edinburgh Napier University from where she graduated with a 1st Class Hons. degree in 2009. Thereafter her career took off in a remarkable manner starting with a much coveted internship in Scotland's centre of photography, Stills Gallery in Edinburgh. Commissions soon followed from prestigious clients such as the Royal Bank of Scotland and the Edinburgh Book and Science festivals. Jill's promising career, which was publicly acknowledged as being that of an "emerging talent in Scotland", was, however, cruelly and tragically cut-short one year after graduation when at the young-age of 23 her life was taken by cancer. To raise funds to assist research into finding a cure for cancer. The promotion of early careers in photography.